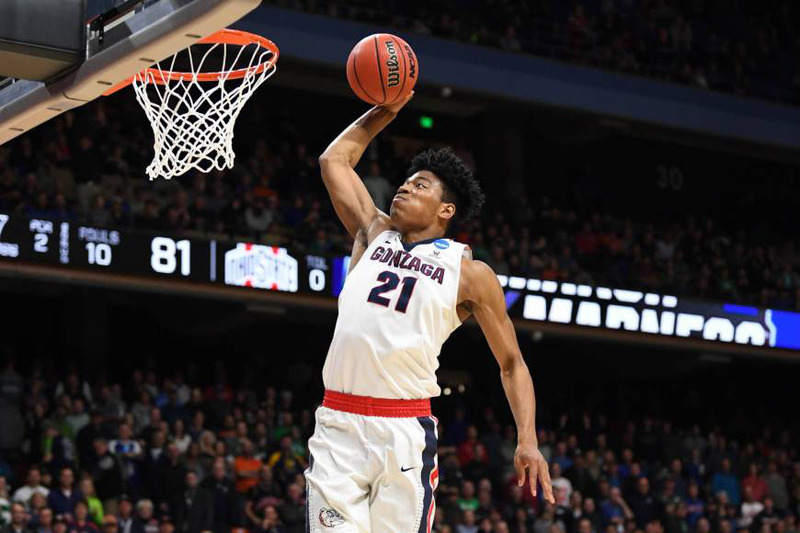 After a dynamic junior season, Gonzaga University forward Rui Hachimura has decided to turn pro. The Toyama Prefecture native declared for the 2019 NBA Draft on Monday. The early-entry deadline for players to announce their intentions to enter the draft is Sunday. Hachimura is projected to be a first-round draft pick, according to most draft prognosticators. In its latest projections, NBAdraftroom.com predicted that Hachimura will be taken with the 19th pick by the San Antonio Spurs. In its latest mock draft (April 4), NBAdraft.net has Hachimura going to the Chicago Bulls at No. 4. For Hachimura, the website’s NBA comparison feature mentioned Antawn Jamison. NBCSports.com, meanwhile, listed the Brooklyn Nets at No. 17 as Hachimura’s next destination. In announcing his decision to enter the draft, Hachimura said he’s ready to begin the next phase of his basketball career. “The last three years at Gonzaga have been a dream come true, and now I’d like to pursue my next dream of playing in the NBA,” Hachimura said in a statement. “This was a significant decision for my family and myself. I just want to thank everyone at Gonzaga, especially the coaching staff and all of my teammates who went to battle with me and are my brothers for life. Hachimura’s explosive athleticism and ability to score inside have impressed talent evaluators, as has his impressive leaping ability. As a college freshman, he received limited playing time for the Bulldogs (128 minutes in 28 games; 2.6 points per game), then became a key backup as a sophomore (11.6 ppg). This past season, he started all 37 Gonzaga games, led the team in scoring (19.7 points) and made 59.1 percent of his shots from the field and pulled down 6.5 rebounds per game. Last week, Hachimura received the Julius Erving Small Forward of the Year Award, recognizing him as the nation’s best at the position. The 203-cm Hachimura was named the West Coast Conference Player of the Year and Second Team AP All-American. The U.S. Basketball Writers Association and the National Association of Basketball Coaches put Hachimura on their All-American First Teams. The NBA Draft Combine will be held May 14-19 in Chicago. 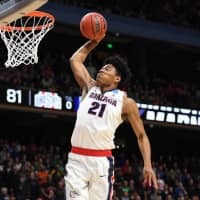 May 29 is the NCAA’s early-entrant withdrawal deadline, meaning Hachimura could still pull out of the draft and retain eligibility at Gonzaga. In 1981, the Golden State Warriors drafted the 230-cm Yasutaka Okayama (eighth round, 171st overall pick), but the Kumamoto Prefecture native never played in the NBA. He became the first Japanese to be drafted by an NBA team. Now, Hachimura, whose father is from the West African nation of Benin, has a chance to become the first drafted player from Japan to appear in NBA games. Also Monday, Duke University freshman sensation Zion Williamson, widely expected to go No. 1 in the draft, announced he’s entering the draft. Williamson, considered a transcendent talent for his generation, averaged 22.6 points (sharing the Atlantic Coast Conference lead with teammate RJ Barrett) and 8.9 rebounds per game.